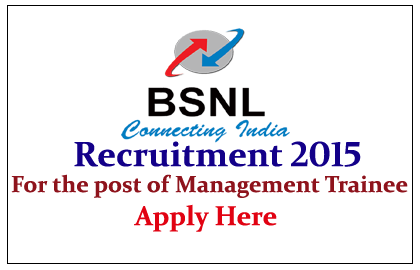 Bharat Sanchar Nigam Limited is hiring for the post of Management Trainees for the year of 2015, Eligible candidate can apply here. Bharat Sanchar Nigam Limited is an Indian telecommunications company headquartered in New Delhi, India. It was incorporated on 15 September 2000 and took over the business of providing of telecom services and network management from the erstwhile Central Government Departments of Telecom Services (DTS) and Telecom Operations (DTO), with effect from 1 October 2000 on a going concern basis. It is the largest provider of fixed telephony, largest broadband services provider with more than 60% Market share, and fourth largest mobile telephony provider in India. Eligible Candidates can Apply online on or before 14 / 06 /2015. Admit card for the exam can be downloaded from the BSNL website www.bsnl.co.in / www.externalexam.bsnl.co.in by the candidates at least before 15 days from the date of written test by using their user name & password.